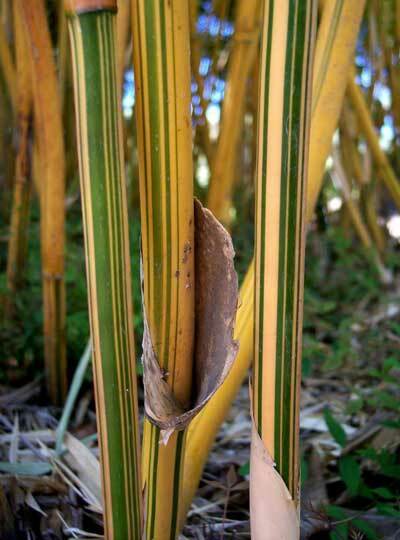 Alphonse Karr is a green striped yellow bamboo that forms dense large clumps. 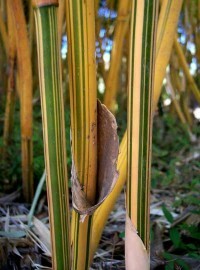 New shoots are often tinted pink or red when exposed to high sunlight. This bamboo makes a great potted container plant, especially in colder climates. It, like other forms of Bambusa multiplex, are among the best bamboos for a well lit area indoors. Bambusa generally grow a very tight cluster of canes, and 'Alphonse Karr' is no exception, making it an excellent choice for a privacy screen where a clumping bamboo is desired. Typical diameter is 1.5 inches in width.